In 2014, the Tishman Environment and Design Center was re-launched with a new mission to foster bold design, policy, and social justice approaches to environmental issues. The Tishman Center was active in Climate Action Week, which culminated in the participation of more than 200 students, faculty, and staff in the People’s Climate March in New York City, as well as the creation of The New School’s groundbreaking Climate Action Plan, which includes the development of a curriculum to support university-wide sustainability learning outcomes. Leading the charge on these initiatives was Michelle DePass, director of the Tishman Center, dean of the Milano School of International Affairs, Management, and Urban Policy, and Tishman Professor of Environmental Policy and Management at The New School. A sought-after civil society leader and veteran of the Environmental Protection Agency (EPA), DePass’ tenure at the center marks the latest achievement in a career steeped in the environmental justice movement. In recognition of her achievements in the field of Education, setting new standards of excellence, dedication and leadership in improving her community and making transformative change,, DePass was recently recognized by City & State as a 2017 CSR Responsible 100 Honoree. 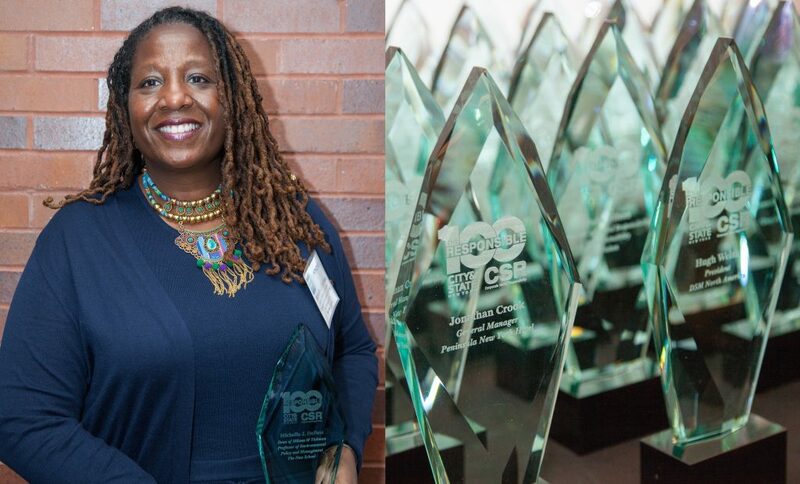 The annual list “honors 100 of New York’s most outstanding corporate citizens.” DePass will receive her award during a December 14 ceremony led by May Malik, Director of Public/Private Partnerships, NYC Service Office of the Mayor. A graduate of Fordham Law School (Juris Doctor) and Baruch College (MA Public Administration), where she was a National Urban Fellow, DePass has demonstrated a strong commitment to environmental justice throughout her career. As the EPA’s Assistant Administrator for International and Tribal Affairs between 2009 and 2013 she was responsible for all dimensions of environmental policy between the EPA and other nations, federally recognized tribal nations, and multilateral institutions and donors. Prior to joining the EPA, DePass was a program officer at the Ford Foundation, with a portfolio focused on the environment and community development, most notably green economy and climate change, environmental health and justice, and indigenous environmental rights. She has also served as founding Executive Director of the New York Environmental Justice Alliance, Senior Policy Advisor to the commissioner of the New Jersey Department of Environmental Protection, and environmental manager for the City of San Jose. At The New School, DePass has worked to position The New School as an academic ally in the environmental justice movement by bringing visiting scholars to the Tishman Center to co-produce research on environmental justice issues including justice implications of the U.S. EPA’s Clean Power Plan and Native and Indigenous resistance movements on climate change. She also initiated efforts to advocate for and support equitable recovery for communities impacted by natural disasters including hurricanes Harvey, Maria, and Irma. DePass also served as a member of the The New School’s Climate Change Working Group, tasked with providing recommendations on the topic of divestment, and providing recommendations for how to create a stronger emphasis and integration of climate change across all aspects of The New School experience. Based on the input from the Working Group and other groups and stakeholders at The New School, the Board of Trustees approved the motion to divest from all fossil fuels in 2015, making The New School the second largest university to do so at that point in time.